When I first met Mr Delightful, back before the earth had cooled, he liked canned condensed bean with bacon soup. If I recall, it tasted okay; but I just have this "thing" about canned soups and convenience foods and stuff that isn't organic. 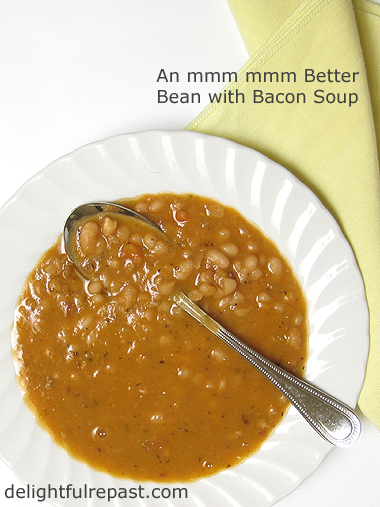 So, naturally, I had to come up with a better bean with bacon soup. Needless to say, even though I don't put the word "organic" in front of every ingredient in my recipes, nearly every ingredient is. But if that's not your thing, you can make it with conventional ingredients. If using conventional bacon, which has far more fat than the organic uncured bacon I use, be sure to drain off the fat. I know it sounds crazy to put ketchup in soup, but all I can say is it's really good. At least with the brand I use. Besides adding a touch of tomato and sweetness to the soup, it adds a little organic vinegar and spices as well. Mr Delightful, the lifelong "mmm mmm good" man, pronounced it "even better, much better." What is your favorite soup? Do you eat it regularly, just when you're sick, only during Soup Weather, or when? 1 In 6-quart Dutch oven, heat olive oil and saute bacon until cooked. (You can skip the oil if you're using conventional bacon; remove all but a tablespoon or two of the fat before adding onions.) Stir in chopped onion and cook until bacon and onions are caramelizing a bit, about 20 minutes. Stir in water and beans. Bring to a boil; you can use that time to chop celery and carrots. Stir in celery and carrots, salt, pepper, thyme and marjoram. Reduce heat and simmer for 2 hours. Note: Organic uncured bacon is so lean, there is no need to drain off the fat as there would be if using conventional bacon. 2 After 2 hours, stir in chicken broth and ketchup. Continue simmering for 1 hour or until done, adding more liquid (water or broth) if needed. With immersion blender, puree the soup a bit to thicken it, leaving most of the beans whole. Note: Dried beans can vary a great deal in how much cooking they require. I find three hours usually works for this, but if your beans are not fully cooked at three hours just keep cooking until they are. If your beans cook faster, then at the 3-hour mark the soup may have thickened to your liking without any pureeing needed. Ketchup in bean soup? Now that's an interesting add. The soup does look very comforting and flavoursome, Jean. Thanks, Angie. I stumbled onto the ketchup accidentally when I opened the cupboard and discovered I was out of tomato paste. Oops, and out of tomato sauce as well. But I did have a bit of organic ketchup in the fridge that needed using up (I hate waste, but I don't use a lot of ketchup). So I tried it, a little at a time, and decided on the perfect amount, which amounts to a tablespoon per large serving. Sully, thank you. I love split pea soup (homemade, of course) and *I* could have a split pea soup diet for 6 to 8 days, but Mr Delightful would never go for it. I don't know why! Yum, this looks real good. Thanks, Ellen! It's my current favorite. I occasionally buy uncured bacon as a treat but usually avoid it as so much fat and salt. Love most bean soups and this sound yummy. This time I'm amongst the very first friend of yours to ... relish your incredible dishes which I'm always so grateful to you for, dearest Jean ! I love soups but have never attempted one with bacon in. My usual soup consists of whatever veggies are in the fridge, with mushrooms for luck. I can never get enough mushrooms in my life...! Thank you for the tip about bean cooking times. Carol, thank you. The Applegate Organic uncured bacon doesn't have much fat and may be lower in salt as well. Some bacon is just loaded with salt. Thank you, Dany. Lovely to hear from you. Wondering what bit of history I'm going to learn about on my next visit to your lovely blog. Pauline, I knoooow! What is it about mushrooms? They truly are something special. This sounds absolutely delicious Jean! I'm just the same with my other half - making fresh homemade versions of the stuff he loves from cans. And homemade soup is so easy and then you know exactly what's gone into it. I'll definitely try this one out. Thank you, Vicky! Let me know how you like it! I'm with you on the canned soup. No thanks. It's just to easy to make it fresh. I make quite a bit of beans in our house but have not tried bean and bacon. Sounds delish! MMMMMMMMM, this sounds yummy. I'll use our homegrown, butchered on the kitchen table, took me days to brine & days to smoke, slap yo' mama, delectable bacon. Probably doesn't count as organic, but it sure does count as delicious!! Thank you, Richard! Bean with Bacon Soup might not be the most photogenic of soups, but it is soooo tasty! Thank you, Dawn! And another great thing about a big pot of homemade soup, it prevents each child picking a different flavor canned soup to be heated up in a separate pan! Mrs Shoes, hat's off to a woman who makes her own bacon! :-) Keep up the good work! As you have probably seen from my blog, being soup has been very popular in our household, as well. I love that you use ketchup for a little bit of flavoring! My rule is, "if it tastes good, do it!" David, thank you. I know some people might scorn ketchup, but when it works, it works! Thank you, Rue! And it freezes so beautifully in my little glass storage containers that you can always have some on hand for sick days. Ah, Jean, you made me laugh with your comments about Mr Delightful and canned soup. Mr Lightarted, growing up in Ohio, was a solid canned soup and Smuckers Jam fan. Growing up in a family where everything was homegrown and made from scratch I needed to turn his head away from the pre-canned and processed foods. Still a work in progress. This Bean with Bacon soup will be a hit. Tis the soup season. Thanks, Sue! Let me know how my soup stacks up against the can in Mr Lightarted's view! "Still a work in progress" - we never give up, do we?! I never scoff at a person's preferred ingredient. If you say ketchup tastes good, I would try it. And it takes women like us to educate our hubbies' palates. 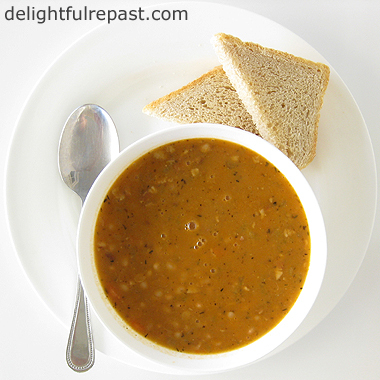 Frankly, there is nothing like a great bean soup to satisfy the tummy. I'm saving your recipe to try. Have a great weekend. Thanks, Marisa. AND for the vote of confidence in my ketchup! Hope you have a great weekend as well. I love bean soup of any kind but hubs won't eat it. I make my own ketchup but won't use store bought since it has so much sugar in its...sounds like it would provide debt of flavor..
Cathy, maybe if you pureed all the beans your hubs wouldn't know it was beans! :D I get organic ketchup because it doesn't have corn syrup like the others. Bet I'd like your homemade! Dear Janice, thank you. And I hope you have a great weekend, too! Your soup sounds wonderful, Jean, and I know,that I would love a big bowl of it! I adore soups, and some of my favorites are Lasagna Soup, chicken noodle, and Pasta Fagiloi. Soups are such comfort foods, aren't they? Thanks, Kitty. Those sound good, too! I make chicken noodle a lot, but not the others. It's been too long - thanks for reminding me of them! Hi Jean. I'm with Mr Delightful there. Some canned soup is good! There is a Scottish company that do Baxters Soups. They are very good. However, I am with you also, Jean, the home made variety can be the best and the most nutritious. Your bacon and bean soup sounds as though it would hit the spot! So, now getting back to the beginning, or even the basics. It was hot and steamy when you met Mr Delightful then Jean? Thank you, and LOL, Tony! Thanks so much for stopping by and taking the time to comment!! Debbie, thank you! Big hug! Thanks, Polly. I haven't tried either of those. Will check them out. Thank you, Tandy. I'm a big 'in case' cook myself, so I always freeze half of this as individual servings in glass containers. Makes life so much easier, doesn't it, when you're prepared for 'in case' days?! There's nothing better than a bowl of homemade soup- I stopped using those old cans of Campbell's Soup years ago. I suppose my favorite soup is Chile Relleno Soup which I just recently made. Your soup certainly looks good- all those beans would certainly improve the digestive system! Looks delicious and perfect to have over a campfire. Thanks for joining the Creative K Kids' Tasty Tuesday. I look forward to seeing what you share with us this week! Thanks, Fran. And I'll definitely check out that Chile Relleno Soup. Amanda, thank you. This week it will be a dessert! Your Soup looks perfect for this cold evening! Thanks so much for sharing your awesome recipe with us at Full Plate Thursday. Hope you are having a great week and come back to see us real soon! Thank you, Miz Helen! I hope you're not having the *crazy cold* cold weather, just some nippy Soup Weather! Bean and bacon never can go wrong,delicious Soup, I can eat any day. I will love it. Thank you, Swathi! I'm thinking it would be really good with your missi roti! Thanks, Jessica. I love tomato soup, too! It can't stand alone as a meal, since it lacks protein, but with a toasted cheese sandwich, it's a comfort food meal!